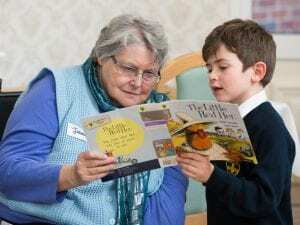 Our Retired Nurses National Home (RNNH) in Bournemouth welcomed fifteen children aged four and five from St Walburga’s Catholic Primary School last week. This marked the first in a series of visits to the care home to encourage intergenerational socialising. 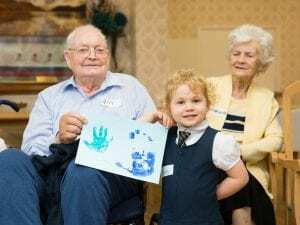 The children spent the session with the care home residents making a friendship wreath by cutting out their hand prints from card. Each child was paired up with a resident, which encouraged conversation and story telling. This is the first of a number of regular visits by the school to the care home. Each week the children and residents will partake in different activities and it is hoped friendships will be formed. 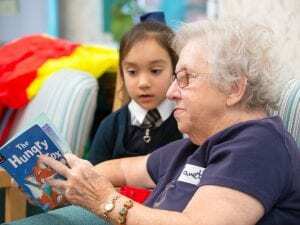 The partnership between St Walburga’s and the RNNH has been inspired by recent research and documentaries that shows how encouraging friendship between older people and children has positive outcomes for both. To find out more about the Retired Nurses National Home, click here.